Dr. Heather Gleaton is a graduate of the University of South Carolina and the University of Georgia College of Veterinary Medicine. She resides in Greenville with her husband, Ralph, and children, RJ and Riley. She has owned Roper Mountain Animal Hospital since 2003. She especially enjoys internal medicine of all small animals. She is a member of the AVMA, GGVMA, and the SCAV. She is a former board member of the March of Dimes, the Animal Emergency Clinic, and the Tri-County Technical College Veterinary Technician Advisory Committee. She is a past president of the GGVMA and was the Outstanding Young Alumnae in 2004 for the College of Science and Math of the University of South Carolina. She has served as the District 4 representative for the SCAV and currently, in her "spare" time, she is a level 10 rated womens gymnastics judge for the USAG. She has also competed on American Ninja Warrior Season 9 in Daytona Beach and currently competes in the National Ninja League. Dr. Ashlee Brown graduated from Clemson University with a degree in Animal Science and minor in Spanish, where she was also a member of the Womens Varsity Rowing team. Ashlee received her DVM from University of Georgia and then completed a rotating Equine Internship at Equine Medical Center of Ocala. She then practiced in Seneca, SC for one year before moving to open a veterinary clinic in Barranquitas, Puerto Rico. Dr Brown has one dog named Deuce and loves to take him hiking. She loves to compete in triathlons and loves all things related to coffee. Dr. Jessica Slangal graduated from Purdue University College of Veterinary Medicine in 2016. She is from Clayton, North Carolina, a small town just east of Raleigh. 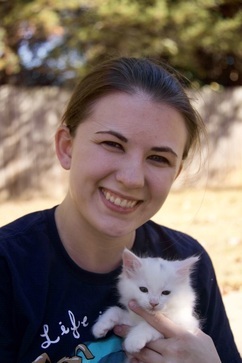 During her undergraduate years at North Carolina State University she worked as a veterinary assistant at a busy small animal practice in Clayton. After graduating from Purdue, she completed an Equine Internship, where she learned the importance of team work and how to care for critical cases. Upon completing the internship, Dr. Slangal went back to work at her home town small animal hospital.Dr. Slangal's interest include wellness care, critical cases, and client education. While Raleigh is home, the mountains were calling which lead her to relocate with her pup Captain and kitten Morgan. In her free time she enjoys running, yoga, and hiking. Dr. LaMier grew up in central New York and completed her undergraduate studies at Wells College with a bachelor’s degree in Biology. During her time at Wells she also played on the Women’s Tennis team. 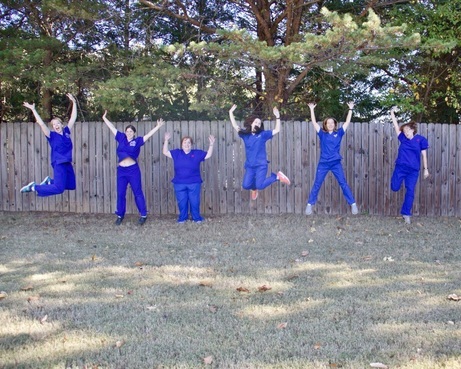 She received her doctorate degree from the University of Missouri College of Veterinary Medicine in 2016 and began her veterinary career with Banfield Pet Hospital here in Greenville, SC. She loves learning new things and expanding her knowledge in all areas of veterinary medicine. Outside of work, Dr. LaMier enjoys hiking, kayaking, and playing volleyball and tennis. Tammy is a Greenville native and a 1994 graduate of Tabernacle Christian School. She is currently a member of Tabernacle Baptist Church. She is also a member of the Alzheimer's Association and does all she can to help them in their quest for a cure. Tammy has been working here since March of 2005 and says that she honestly enjoys her job. She loves meeting new people every day and being able to call clients by their name when they walk in the door. To her, you and your pet are her extended family and she takes pride in that. When not working, she enjoys reading, relaxing by the lake, and being with family and friends. Her family is her first priority. She looks forward to meeting many more clients, new and existing, with their pets in the years to come. Michelle has been working for our hospital since 2007 after moving here from Connecticut. When not at the hospital she enjoys spending time with her family and watching her daughter dance at college in NYC. Holly has been working at our hospital since 2007 after being a client for many years. Her son and daughter are recent graduates of Clemson University and they enjoy spending weekends at the beach. She is a dachshund enthusiast. Sarah joined our staff after doing an internship with us in the summer of 2012 through the Tri-County Technical College Veterinary Technology program. Sarah graduated with her veterinary technology degree in May of 2013. Sara joined us in the summer of 2013 after completing her externship with us for Tri-County Technical College. She obtained her degree in Veterinary Technology in 2013. Alycia graduated from Lincoln Memorial University in TN in December of 2016 with a Bachelors Degree in Veterinary Technology and started working for Roper Mtn AH in February of 2017. Sarah came to us with several years of experience as a licensed technician. She is a graduate of Penn Foster College and has a soft spot for exotic animals. Ashley joined our team as a veterinary assistant in June of 2017. Courtney joined our team in June of 2018. She is a recent college graduate from East Stroudsburg University in East Stroudsburg, Pennsylvania. She studied biology for 5 years and received her B.S. in Biology on May 5, 2018. She moved to Greenville, SC in June 2018. In August 2017 she traveled abroad to Ghana, Africa where she studied the culture and economy. She plans to go back to school in the near future to get a more specific degree. She has one dog, Gus, who she rescued from Alabama in 2010. The most important thing to her is family. On her days off she enjoys basking in the sun, reading, and hanging with friends.